This unit is a single antenna mounted underneath the conveyor belt. 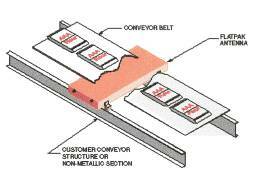 It is best suited for those who require nothing above the conveyor belt because the material being conveyed is odd shaped or of varying height and where the metal is lying on or close to the belt. Sensitivity is greatest close to the belt and decreases with distance from the antenna. Maximum detector capability is dependent on multiple factors and must be evaluated for each application. The Model 50 Flat Pack is suited to rugged environments. It will detect both magnetic & non-magnetic, ferrous & non-ferrous metals and is not affected by most process materials. An industrial metal detector proven to be dependable under adverse conditions such as dust, moisture and vibrations, the Tectron® Model 50 Flat Pack provides years of trouble free operation.